Do you know your Gran Gala from your Grand Marnier? Orange liqueur is a popular ingredient in cocktails, from classics like the Margarita and Sidecar to the contemporary Cosmopolitan. It’s also used in foods from chicken to mousse. Orange liqueurs are made from the peel of bitter oranges—generally varieties that are too bitter to enjoy as a fruit. Does it make a difference which one you buy? Name brands like Cointreau, Grand Marnier and Grand Gala are generally better products than generics like Curaçao and triple sec, even if those products are made by well-known producers. Some will be sweeter, some more bitter, some more complex. What you can do is hit your favorite bar with some friends, order shots of all their orange liqueurs, and decide which you like the best. The original Margarita recipe was made with Cointreau. Photo | Wikimedia. 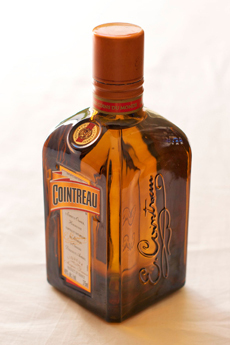 Cointreau is a brand of triple sec, a finer product than products simply labeled “triple sec.” It was first produced in 1875 Edouard Cointreau in his family’s distillery in Angers, France. It is stronger-flavored and more complex than most triple secs. Curaçao is a style of liqueur made from the dried peels of the laraha citrus fruit, grown on the island of Curaçao in the Netherlands Antilles (southeast of the Virgin Islands in the Caribbean). The name is generic. The laraha developed from the sweet Valencia orange planted by Spanish explorers. The orange would not grow successfully in the climate of Curaçao; the fruits produced were small, bitter and inedible. However, the peel remained aromatic and true to the Valencia varietal, and made a delicious liqueur. The trees were bred into the current laraha species, still inedible. Some brands are colored blue or bright orange; the color adds no flavor. Grand Marnier. Photo | Wikimedia. 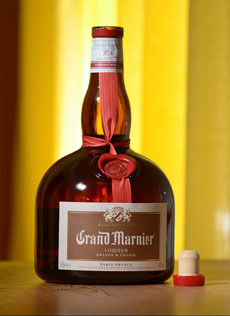 Grand Marnier is a Cognac-based brand of orange liqueur, generally considered to be the finest quality of the orange liqueurs. It is made by blending macerated bitter orange skins in neutral alcohol with Cognac, and aging this spirit in oak barrels.It was created by Louis-Alexandre and first sold in 1880 as Curaçao Marnier. It became referred to as a “Grand Curaçao” because of the power of the Cognac. Gran Gala is the Italian competitor to Grand Marnier, made by Stock Spirits of Trieste in Italy since 1884. It suffers from a lack of advertising awareness: The spirit is as fine as Grand Marnier; a side-by-side tasting shows it to be more assertive and more complex. Because of the layers of flavor in both Grand Marnier and Gran Gala, neither gives as pure an orange flavor as Cointreau. Triple sec is a generic name for an orange-flavored liqueur made from the dried peel of oranges; the name means triple distilled. It is made from the same bitter oranges grown on the island of Curaçao as the liqueur Curaçao; the difference is that triple sec is about 1/3 as sweet as Curaçao. The orange skins are macerated (steeped) in alcohol and then distilled. Some brands names you may encounter include Bols, Combier, DeKuyper and Marie Brizard. Some sources claim that Triple Sec was invented in 1834 by Jean-Baptiste Combier in Saumur, France. When you taste different orange liqueurs, keep tasting notes. You may prefer one for sipping, another for mixed drinks.